A quick reference guide for communicating with each of the four main DiSC® styles. We all want to know that we matter…that others see us for the unique individuals we are and value the contributions we make. And it’s not just anecdotal. There’s plenty of evidence connecting recognition and engagement—from Gallup to research behind the powerful LPI® (Leadership Practices Inventory®). The next time you’re preparing to launch a project or prepare for a difficult conversation, check out the article below to get quick tips on how to build more effective relationships with your colleagues. You may realize that what motivates you isn’t the same for everyone else. Do you work with a D—someone who tends toward the Dominance style on the Everything DiSC Workplace® model? Or are you a D yourself? Even if you have a secondary style—Di (with influence) or DC (with Conscientiousness) you will likely relate to most of the D style characteristics. Always on the lookout for new challenges and opportunities, highly-focused and strong-willed Ds are driven to achieve Results. They are willing to do what it takes to reach their goals. Motivated by the need to make their mark, to have authority over projects and processes, they don’t let obstacles get in their way. They keep things moving forward. Action is a high priority for D-style talent, making a fast-paced environment that will keep them fully engaged ideal. Strict rules and protocols stress them out, and they get bogged down by endless and unproductive meetings and inefficient procedures. They like to hit the ground running, assertively promote their bold ideas, and are ready to make quick decisions. Independent-minded D-style types also prioritize Challenge. Straight-talking Ds are often the ones willing to speak up—to address the elephant in the room—when they see potential flaws or inefficiencies. Because controlling outcomes is so important, they frequently take a skeptical and questioning approach to ideas they don’t agree with and can come off as somewhat intimidating. People with a D style are often highly respected by the organization. With their direct, businesslike approach to opportunities and challenges, they are seen as go-getters who deliver. However, sometimes the D style can be intimidating when communicating with other styles. And an overly strong D type may be more outspoken, more in-your-face than is comfortable for others. Their bottom-line results orientation and need to win also may cause them to come off as impatient and demanding. But this communication style brings a lot of strengths to the team, including an ability to keep others focused on achieving results. They tend to move fast themselves and like to keep projects (and others) moving toward the finish line at a pretty fast clip. If you are a different personality style, understanding the priorities and strengths of the D style can help strengthen your working relationships. Take into consideration their key motivators—Results, Action, and Challenge—when working together. If you tend to a D workstyle yourself, being more aware will also help you flex your approach to others in order to ensure you’re bringing your best to team interactions. i Styles Keep it Lively! People communicate differently based on their styles and preferences. And taking the Everything DiSC Workplace® assessment is an important first step to help you better understand why you find you really click with some teammates while you have to work harder to connect with others. For example, consider the lively i styles, or those who have Influence as their primary style (including the iS style, with Steadiness, and the iD style, with Dominance). Your high-energy colleagues with the i style bring tremendous Enthusiasm and optimism to their work and to their relationships. They are the cheerleaders who naturally encourage team spirit, who get others excited about their goals and ideas. Approaching nearly every situation with a positive and upbeat attitude, they assume that others act with the best of intentions. Open and expressive of their own opinions and emotions, they also tend to be open and accepting of new people and ideas, too. Placing a high value on Collaboration, i styles prefer projects where they can work closely with others—bringing more fun to the work and, they believe, delivering better outcomes. Friendly and outgoing, they are motivated by any opportunity to meet people they don’t know, connect strangers with others whom they might not otherwise have ever met, and inspire everyone to do their best. Similar to their D-style co-workers, i-style contributors may also like excitement and prefer a fast-paced work environment. Energized by innovation and working toward groundbreaking solutions, they strive to take Action. These are your teammates and colleagues that want to hit the ground running. And with their high-spirited approach to projects and people, it is their ability to initiate and make quick decisions that can keep the group moving forward. Watch an i style in action. Co-workers, bosses, direct reports, and others no doubt admire their i-style colleagues most for their excitement, optimism, high energy, and their ability to create a spirit of community to achieve the best outcomes possible. Like all styles, however, people who tend to the i style can have their limitations. They may be reluctant to give negative feedback even when their valuable insight might contribute positively to the team’s success. Because of their own outgoing and friendly nature, others may be offended by what they perceive as an i style’s intrusion into their personal space. And some may perceive the brainstorming sessions they lead to be disorganized and simply an endless discussion of blue-sky possibilities. Using the Everything DiSC model, you’ll learn that your i-style co-workers tend to be more open to new people and ideas, yet also may be seen as overly optimistic and emotional. Here are a few tips to consider when interacting with someone with an i-style. Keep in mind the priorities that shape the workplace experience of your i-style colleagues—Action, Enthusiasm, and Collaboration—to help strengthen your working relationships. Listen to their ideas. Minimize details. And if you are an i, there are always plenty of opportunities to learn more about ways that you can relate more effectively to other styles. The meeting is getting tense. People are talking over each other. And then someone calls a time-out and says, “can we just step back for a minute? I think we have some common ground we’re missing.” Chances are that person will be an S (for Steadiness) on the Everything DiSC Workplace® model. This style may also include a secondary style—e.g., Si (with influence) or SC (with Conscientiousness—but they’ll likely relate to the S communication preferences. S-style team members find great satisfaction in accommodating others and are happy to give Support whenever and wherever they can. Motivated by being around those who are empathetic and accepting—who genuinely care—they don’t need to win to feel good about themselves. Instead, they are quick to share credit. Because an S style’s self-esteem isn’t necessarily tied to accomplishments, they are often perfectly comfortable working behind-the-scenes. A key priority for S styles who value harmony and consistency is Stability. Both reliable and cautious, they do their best to minimize surprises and create a work environment that is steady and predictable. Preferring to follow the rules, others look to them to create helpful systems and procedures and know they can be counted on to follow through on their commitments. Bringing people together—like their i-style colleagues—is a key priority for S styles. As they focus on Collaboration and being a strong team player, they tend to take the lead in making personal connections and creating a spirit of community that will keep the team working toward a common goal. Warm, friendly, and instinctively trusting, they are always open to new people and ideas. And because they tend to see others’ points of view, people feel understood and accepted. Watch an S style in action. Non-judgmental and accepting of others, people with the S style are often seen as peacemakers. They are driven to contribute to a calm, stable environment and do their part to contribute to the group’s success. Highly dependable, you know you can count on them to deliver; they are the ones who are more willing to take one for the team. Compared to those with other styles—e.g., the more fast-paced D- and i-styles—they will take more time to ponder options and no doubt have more patience for long, routine projects that require steadiness and consistency—essential qualities that every organization needs. Responding positively to the priorities of your S-style colleagues—Support, Stability, Collaboration—and flexing your own style preferences to meet somewhere in the middle will go a long way to strengthen your working relationships and improve the effectiveness of your team. And if you happen to be an S style yourself, learn more about what stressors you experience when working with other styles and strategies that can help you flex as well. They get it done right! 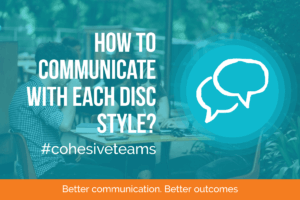 If you need someone to double check your work, to ensure that every “i” is dotted and “t” is crossed, look no further than your colleague who is a C or Conscientiousness style on the Everything DiSC Workplace® model. That includes those who have secondary styles such as CS and CD, sharing common preferences with S=Steadiness and D=Dominance types as well. Accuracy is a top priority in everything C-style talent does. They zero-in on doing everything they can to get things right, to avoid mistakes, and to ensure high-quality outcomes. Refusing to settle for sloppy work, C styles are a team’s go-to for developing superior systems and processes to help them carefully analyze objective facts in order to make logical decisions. Skeptical of risky ideas and of making decisions too quickly—before all the facts can be sufficiently analyzed and considered—colleagues with the C style focus on maintaining Stability to produce consistent results. Perhaps more self-controlled and cautious than other DiSC® styles, their preferred work environment is predictable and stable, where chaos and uncertainty won’t threaten the quality of their work. The quiet diligence of the C style is often one of the qualities others admire most. Like their D-style colleagues, C styles also will often be the skeptical voice in the group willing to Challenge people to look at things more carefully. If unconvinced of a new idea, they will question people’s opinion, and point out problems and flaws—all in the interest of getting things right. Their preference for performing in-depth analysis of projects and ideas means that they tend to prefer working alone, although contributing to a team gives them the chance to give advice and share knowledge and expertise. Watch a C style in action. Known for their dedication to accuracy, sloppy work is not an option for those with a C style. Logic, exacting standards—these are the influencers that drive your colleagues to succeed. Like the cautious and reflective S style, C styles will take the time they need to make good decisions. They are often the skeptic in the group willing to challenge the process. And although the success of every team, department, and organization rightly depends on the C’s need (some would say passion) for precision and delivering superior results, others can be extremely frustrated by what feels like “analysis paralysis” that stands in the way of progress. You might think that C styles would end up in highly analytical careers—technicians, scientists, accountants, engineers. But not everyone makes that choice. Because we are all a blend of all four styles, people with the C style also can find themselves in very creative or unstructured roles. They may just approach the work differently. It often doesn’t take a radical shift in behavior or approach to improve communication with others. Sometimes it’s a small tweak here or there that makes all the difference in the world. And there’s always plenty more to learn about your own DiSC style and those of others as you work to sustain productive relationships and build better workplaces.